A disaccharide is the sugar formed when two monosaccharides are joined by glycosidic linkage. Like monosaccharides, disaccharides are soluble in water. Three common examples are sucrose, lactose, and maltose. Augustin-Pierre Dubrunfaut was a French chemist. Cornelius O'Sullivan, FRS was an Irish brewer's chemist. The suffix -ose is used in biochemistry to form the names of sugars. This Latin suffix means "full of", "abounding in", "given to", or "like". Numerous systems exist to name specific sugars more descriptively. n. They are usually colorless, water-soluble, and crystalline solids. Some monosaccharides have a sweet taste. An oligosaccharide is a saccharide polymer containing a small number of monosaccharides. Oligosaccharides can have many functions including cell recognition and cell binding. For example, glycolipids have an important role in the immune response. Polysaccharides are polymeric carbohydrate molecules composed of long chains of monosaccharide units bound together by glycosidic linkages, and on hydrolysis give the constituent monosaccharides or oligosaccharides. They range in structure from linear to highly branched. Examples include storage polysaccharides such as starch and glycogen, and structural polysaccharides such as cellulose and chitin. In chemistry, isomers are ions or molecules with identical formulas but distinct structures. Isomers do not necessarily share similar properties. Two main forms of isomerism are structural isomerism and stereoisomerism. Maltase is an enzyme located in on the brush border of the small intestine that breaks down the disaccharide maltose. Maltase catalyzes the hydrolysis of maltose to the simple sugar glucose. This enzyme is found in plants, bacteria, and yeast. Acid maltase deficiency is categorized into three separate types based on the age of onset of symptoms in the affected individual. 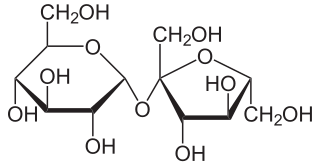 Fructose, or fruit sugar, is a simple ketonic monosaccharide found in many plants, where it is often bonded to glucose to form the disaccharide sucrose. It is one of the three dietary monosaccharides, along with glucose and galactose, that are absorbed directly into blood during digestion. Fructose was discovered by French chemist Augustin-Pierre Dubrunfaut in 1847. The name "fructose" was coined in 1857 by the English chemist William Allen Miller. Pure, dry fructose is a sweet, white, odorless, crystalline solid, and is the most water-soluble of all the sugars. Fructose is found in honey, tree and vine fruits, flowers, berries, and most root vegetables. Amylase is an enzyme that catalyses the hydrolysis of starch into sugars. Amylase is present in the saliva of humans and some other mammals, where it begins the chemical process of digestion. Foods that contain large amounts of starch but little sugar, such as rice and potatoes, may acquire a slightly sweet taste as they are chewed because amylase degrades some of their starch into sugar. The pancreas and salivary gland make amylase to hydrolyse dietary starch into disaccharides and trisaccharides which are converted by other enzymes to glucose to supply the body with energy. Plants and some bacteria also produce amylase. As diastase, amylase is the first enzyme to be discovered and isolated. Specific amylase proteins are designated by different Greek letters. All amylases are glycoside hydrolases and act on α-1,4-glycosidic bonds. In chemistry, a glycoside is a molecule in which a sugar is bound to another functional group via a glycosidic bond. Glycosides play numerous important roles in living organisms. Many plants store chemicals in the form of inactive glycosides. These can be activated by enzyme hydrolysis, which causes the sugar part to be broken off, making the chemical available for use. Many such plant glycosides are used as medications. Several species of Heliconius butterfly are capable of incorporating these plant compounds as a form of chemical defense against predators. In animals and humans, poisons are often bound to sugar molecules as part of their elimination from the body. In brewing and distilling, mashing is the process of combining a mix of grains – typically malted barley with supplementary grains such as corn, sorghum, rye, or wheat – known as the "grain bill" with water and then heating the mixture. Mashing allows the enzymes in the malt to break down the starch in the grain into sugars, typically maltose to create a malty liquid called wort. The two main methods of mashing are infusion mashing, in which the grains are heated in one vessel, and decoction mashing, in which a proportion of the grains are boiled and then returned to the mash, raising the temperature. Mashing involves pauses at certain temperatures and takes place in a "mash tun" – an insulated brewing vessel with a false bottom. Glucose 1-phosphate is a glucose molecule with a phosphate group on the 1'-carbon. It can exist in either the α- or β-anomeric form. Carbohydrase is a set of enzymes that catalyzes 5 types of breakdown during carbohydrates into simple sugars. In organic chemistry, the anomeric effect or Edward-Lemieux effect is a stereoelectronic effect that describes the tendency of heteroatomic substituents adjacent to a heteroatom within a cyclohexane ring to prefer the axial orientation instead of the less hindered equatorial orientation that would be expected from steric considerations. This effect was originally observed in pyranose rings by J. T. Edward in 1955 when studying carbohydrate chemistry. 1 2 Stoker, H. Stephen (2015-01-02). Organic and Biological Chemistry. Cengage Learning. ISBN 9781305686458. 1 2 Fruton, Joseph S (1999). Proteins, Enzymes, Genes: The Interplay of Chemistry and Biology. Chelsea, Michigan: Yale University Press. p. 144. ISBN 0300153597 . Retrieved 21 October 2017. ↑ O'Sullivan, Cornelius (1872). "XXI. ?On the transformation-products of starch". Journal of the Chemical Society. 25: 579–588. doi:10.1039/JS8722500579 . Retrieved 11 December 2014. ↑ Belitz, H.-D.; Grosch, Werner; Schieberle, Peter (2009-01-15). Food Chemistry. Springer Science & Business Media. p. 863. ISBN 9783540699330. ↑ Spillane, W. J. (2006-07-17). Optimising Sweet Taste in Foods. Woodhead Publishing. p. 271. ISBN 9781845691646. ↑ Furia, Thomas E. (1973-01-02). CRC Handbook of Food Additives, Second Edition. CRC Press. ISBN 9780849305429. ↑ Whelan, W. J.; Cameron, Margaret P. (2009-09-16). Control of Glycogen Metabolism. John Wiley & Sons. p. 60. ISBN 9780470716885.